I love the convenience of not having to change out my glasses, just slip these on over my regular bifocals. love wearing them and it helps with the winter glare also. I plan to get more, really fits over my tested shades! I use it over my tested shades to protect sides of my eyes, due to light sensitivities! Really need these when driving my car or mowing my lawn. These sunglasses fit great over my regular glasses. They make things easier to see. It is nice to have a pair of sunglasses that are reasonabbly priced. Great fit over my prescription glasses. Perfect for going out in the sun. A good buy. This is the SECOND time I purchse these sunglasses. The reason I keep buying these sunglasses is that I keep leaving them at different places and when I return to get them, someone else has taken my This is the reason I purchase two pair at a time. Since my husband and I both wear glasses, I bought two pair. I wish I would have bought four so that I could keep pairs in the car, etc. They do fit easily over eye-glasses. Wear over prescr. glasses inside and out. Great over the glasses shades. Good vision in the sun! Best sunglasses ever; they can break but still the best. Have purchased these many times, they really block out glare and sunlight very well. Love these sunglasses. Effective for glare of sun coming into car through windshield as well as "non-glare" situations. The Wraparound Sunglasses are great for after eye surgery. I had eye surgery and need to purchase the Sunglasses and seen then Online and ordered them. They are very good for wearing in the sun, after having the surgery. Very good product. Thanks. I love these sunglasses because I have prescription glasses and they fit just perfectly over my regular glasses. They are so easy to take on and off. I just love them. In fact, I ordered two pairs in case I lose one!! I would highly recommend them to all folks with prescription glasses that need shades of some kind. And, they make good eye protection for folks that just want to wear sunshades by themselves. These are a great alternative to costly prescription sunglasses. I would buy this products again and tell friends about them. I bought extra because I have a habit of letting sunglasses on the seat then sit on them. I'm trying hard not to do that with these sunglasses. I have a pair to wear and an extra pair in each of out cars, a pair in the kitchen for when I got out to get the mail or to work in the yard. Probably because these sunglasses have brownish lens, I can go indoors and still be able to see. The greenish ones made it too dark. I'm very happy with my purchase. Great service. Product as described. Thank You! The sunglasses fit over my regualr glasses and and re absolutely great. I can see very clearly when driving. I love them. For my elderly mother. Fits great over her prescription glasses so she can enjoy sitting on her porch again! I love these sunglasses I finally have something that fits over my regular glasses. The price is good. They fit well over your glasses. They DO touch your prescription glasses so you need to check for scratching. This is the second time i have ordered these, hubby works outdoors wants 2 pair on standby at all times. Wonderful for the bright Texas sun! I have purchased these before. I love them. I have never broken a pair, however, I miss-place them and have them taken. I have several pair of these glasses, they fit over my prescription glasses. The fit is secure and not at all uncomfortable as with some glasses I have tried. The clarity is quality as well. I have been instructed by my Optometrist to always wear sunglasses outside and these fit the bill completely. I have bought a few pair for my friend as well and she loves them also. So glad I bought 2 of these....will be purchasing more in the future!! U/V protection that makes me look cool! Had cataracts removed this year and still have to wear glasses and the sun is brighter since the surgery and this product really helps. Saved me from having to purchase perscription sunglasses and having to them back and forth. This product is fantastic!!!! Best sunglasses I ever owned! These sunglasses protect my eyes from the sun and the HD sharpens my vison. New sunglasses protect as well as improve views. These should have locators on them. I've already lost one pair of the two I bought. Very easily fits over prescription glasses and the sun is no longer a problem. I can even wear them without my regular prescription glasses which is a plus as I don't need my prescription eyewear except for reading - so I rarely wear my prescription glasses behind them. Now I hope that I will get an email saying that they now offer the NIGHT VISION glasses as I could use a few more pairs of those. I needed a new pair of sunglasses. These are much better than clip on's. Great when driving towards the sun. I love the fact that they fit well over my glasses and don't look like clip ons. I can read with these on. My husband has prescription sunglasses but they don't turn dark in the car so he decided to try these being the fit over your glasses. Look at clip on ones in a local store but if you get new frames you most likely have to purchase them again due to custom size. These sunglasses should last a lot longer even if you get new prescription glasses. Fit comfortably over my rx glasses, no more switching glasses. I would recommend them. I love these they keep the sun out of my eyes but also fit over my glasses im very impressed. Easy for me to put on while driving if suddenly blinded by sun or oncoming headlights. Lenses can get scratched kicking around in the glove box so I purchased as a replacement. These glasses do their job with a good fit around my regular glasses. Clip-on's didn't quite do the job because I could see the black clips and it was distracting. There is no problem with these except they are not bery stylish but they get the job done. I have transition lenses and they are useless in a vehicle. These solved the problem. Blocks out the sun & fits over glasses but are very large & uncomfortable. Sun glasses are not dark enough. I use them but not what i really want. The glasses do not keep the glare out of your vision, like I would want. I tested these sunglasses with a UV flashlight and they don't offer UV protection. I have purchased similar sunglasses from other sites that do have proper UV protection, and I have tested many pairs of UV sunglasses. You can harm your eyes if you wear sunglasses without UV protection. I bought these to replace a pair of different brand of wrap-around sunglasses that were a gift to wear over my regular glasses. This brand works well enough on it's own but does not fit well over my every day glasses. It slips off of my regular glasses (which are relatively small) leaving a gap were the sun comes in. So...if the main reason for the purchase is to wear over your existing glasses, I would go with a different brand. Use and really like, so I'm ordering a "spare?. To hide the sun from my eyes. I didn't get Transitions in my prescription glasses. I love the idea of not having to either switch between regular glasses and sunglasses. I do not like clip-on sunglasses. They provide total UV protection for eyeglasses wearers. I had ordered these before and loved them. Now I cannot find them so I ordered some more and a pair for my friend. friend purchased these and advised that they help her when driving during the day. Thought I would give them a try. Have ordered many times. I share with family and friends. They fit over glasses well. Used these for years and love them! I just keep ordering! To protect my eyes during daytime/evening bright sunlight while driving. Fits over prescription glasses, protect my eyes. looked all over for sunglasses that would fit over glasses. found them here. I wanted to try wraparounds and the price was too good to pass up. 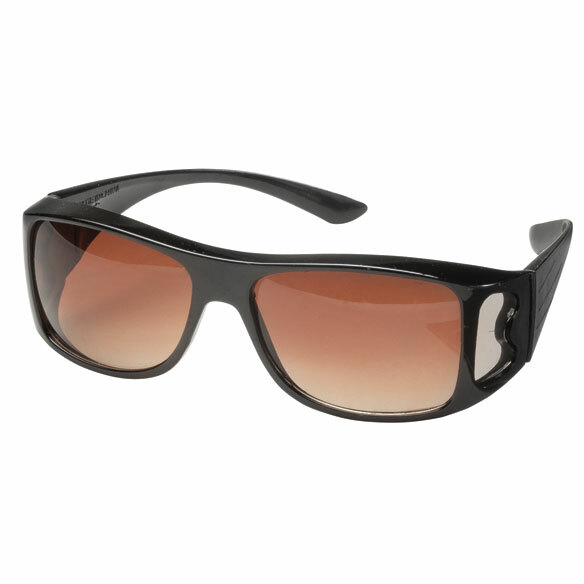 I love wrap around glasses for boating, convertible riding, and the beach. Can these be worn by themselves? BEST ANSWER: They can be worn alone, but I use them with my prescription glasses. Can these be worn as sunglasses not over other eyeglasses? BEST ANSWER: wear them with and without eyeglasses. what is length from side to side and from top of lense to bottom? BEST ANSWER: Thank you for your question. These glasses measure 6 ½” across to the side bows. In the front, the bows are 1” high. The lenses are 1 5/8” high. The glasses themselves are 1 ¾” high including the frame. We hope this information will be of help to you.